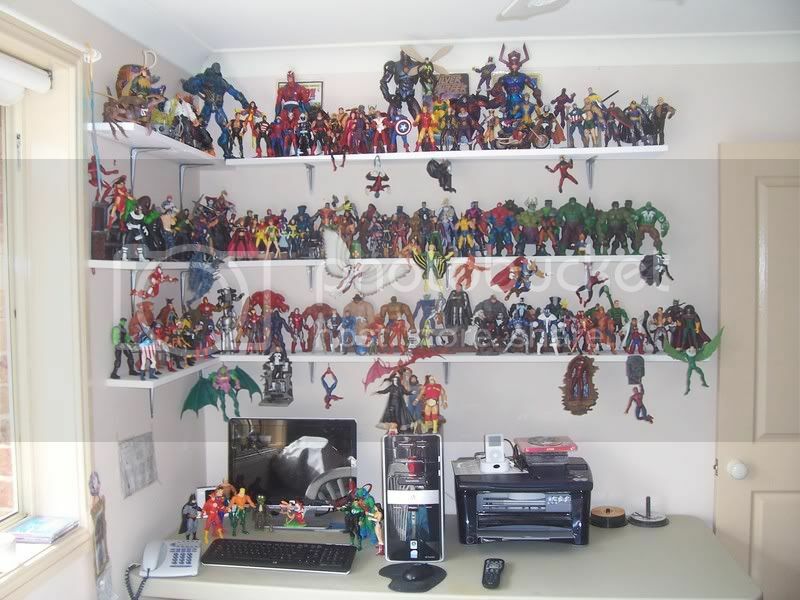 So you have a great action figure collection but you wonder how should you display it? Well there are a few things to consider. The first will be the space you have and the amount you have to display. You may have too many to display all at once and you may need to rotate your display the way museums rotate their exhibits. 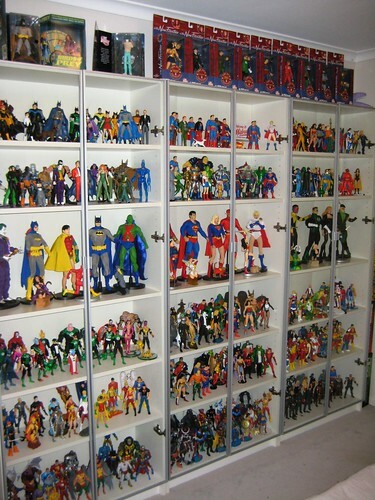 This is after all Your Action Figure Museum and you should treat it that way. 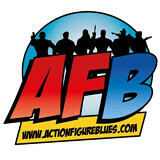 Another factor to include is will the action figures be out loose or Mint On Card (MOC) or Mint In Box (MIB). 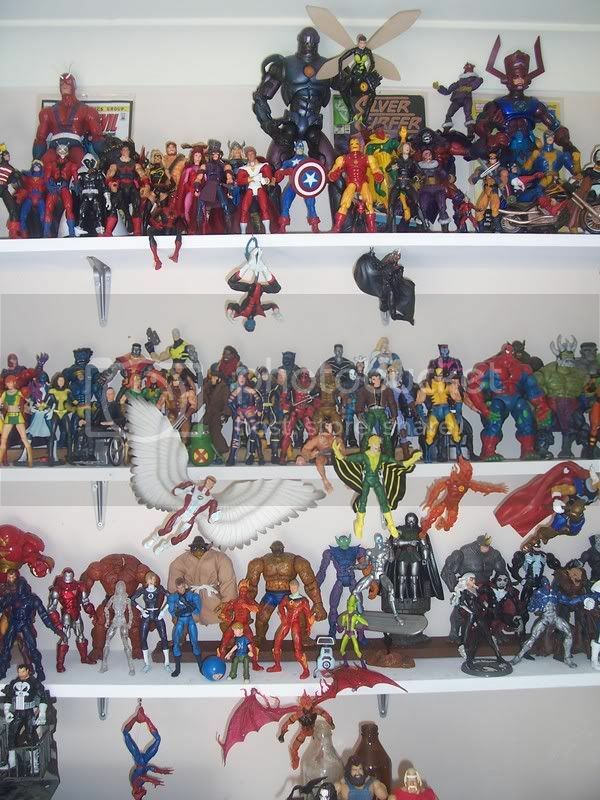 Packaged action figures will take up more room and may require a different approach to how you display them. Take a good look at what the others here have done with their collections. There are some great ideas here on this board and others like it on the Internet. 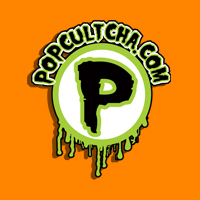 Most collectors like us have tried one thing or another so you can learn from our experience. 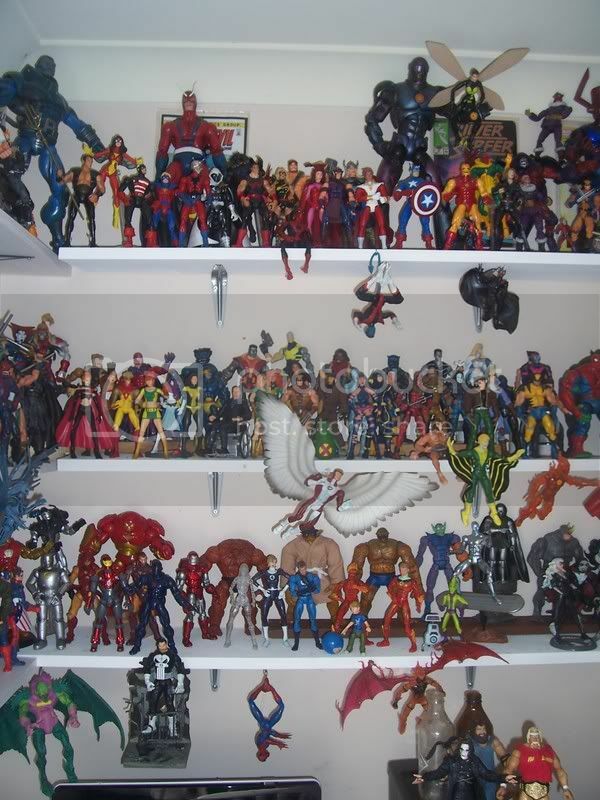 Here is what my room evolved into over the first 10 years of my collection. It was basic open bookcases, I then added wood shelving and then glass shelving. It was basically putting up whatever I could afford as I needed to put it up. It served me well for many years but there was no common design flow and everything was everywhere. It ended up looking too cluttered. Since collections start small and tend to grow over time I think many others have had similar experiences. So my collection got taken down and put in storage for a few years and I started looking for a new way to display the collection. I looked at other people’s collections. 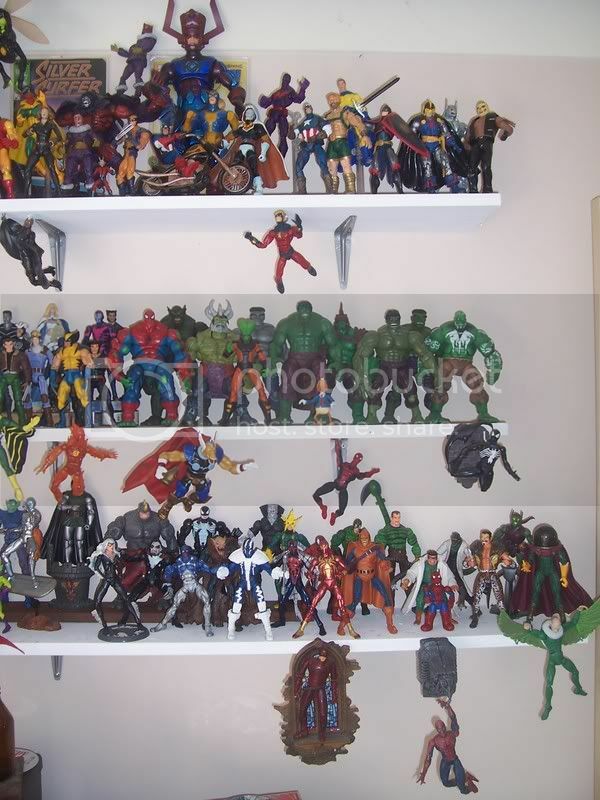 I looked at home improvement stores and custom display systems designed for action figures and collectibles. I read reviews of different systems and when I decided what I wanted to use I bought one to try out. I drew up a scale floor plan to make sure everything fit where I wanted it to fit. It is easier to move things around on paper than to do it for real. Take pictures of your space and the things you want to use. The human eye looks at real life one way and still life (pictures) another. I took thousands of digital pictures as I worked on my room. It not only documented the progress but also allowed me to see it differently and put things in perspective. Another consideration was Hurricanes. I had real wood bookcases made. Yes, they are more expensive but they are also a lot stronger than any particleboard laminated bookcase you get in most stores. Having had to take down the collection (when it was much smaller) twice I wanted something that would protect the collection and not need to be taken down. If you live in an area that gets hit but severe storms you may want to take this into consideration. Bookcases do not need to be big and deep to be effective. Here Andy has great simple clean design that does not take up too much depth. Bookcases don’t have to be all wood either. Here Westy has a great example of all glass cases. Perfect for lighting and not creating too much shadow. My Spider-Man Shelf as it currently stands. A tiered display is nothing more than putting your display on a set of steps. 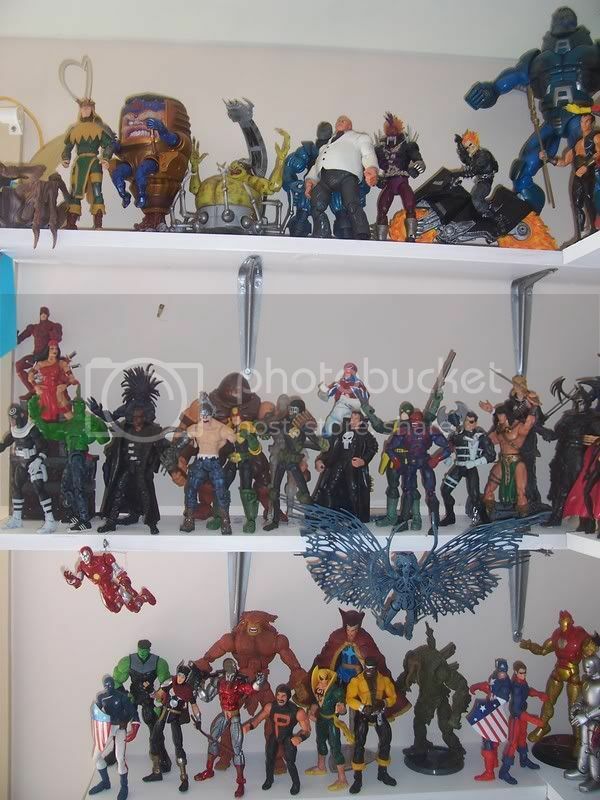 This is perfect of putting many more figures on a shelf and still be able to see them all. You will need to take into consideration if you will use figure stands or not. 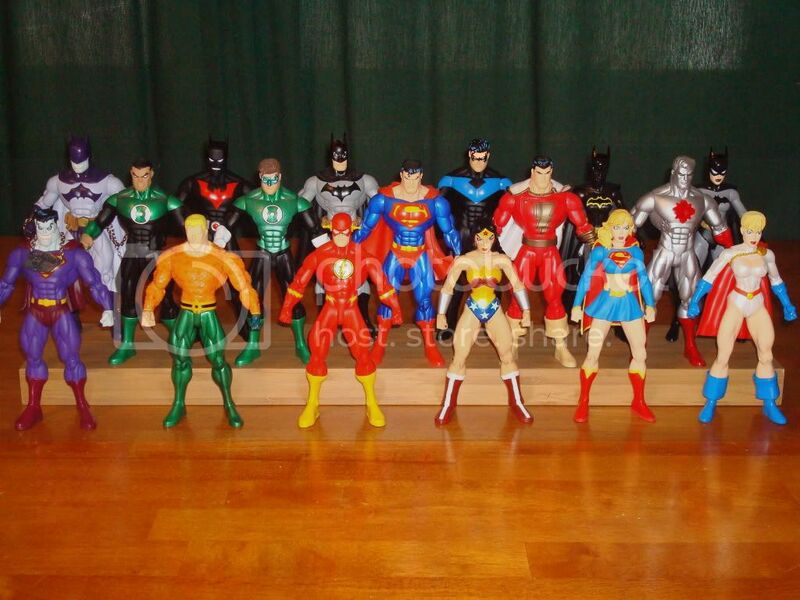 Some figures like DC Direct and series JLA and others have stands that come with the figures. The stands look great but will take up more space. I used a Display System I from Mini Mag Stands (I did a review on this board) These are made of metal and powder coated. The ones I used were made in a custom width for my bookcases. There are many other tiered systems out there in solid plastic and clear acrylic and other material that will work well too. Originally I had expandable plastic tiered trays that are for use in a pantry. They were my first attempt at “stadium seating” for my display. I got them at a kitchen tool store but you can find other places I would guess too. They are white and fit in well and could be painted any color. I use them in my new room too. Only I glued a few of them together and cut two of the into a corner section and put JLU on them. 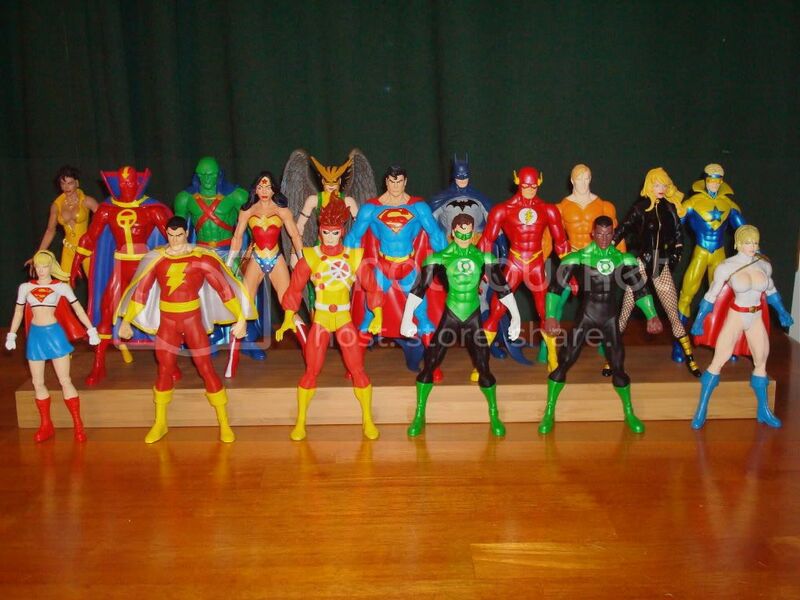 These plastic stands come in different sizes and the ones the JLU now stand on are larger ones that G.I. Joe used to stand on. This shows how shallow a normal book case is compared to the custom bookcases and how the Mini Mag Stands Display System I hangs out over the shelf. To use stands or not depends upon your preference and you shelf space. The system I use is metal so I can use small magnet stands from Mini Mag Stands to hold them firmly in place. I also glued some of my JLU directly to the plastic display they stand on. I did not want a domino effect massive fall so I compromised. I don’t suggest you glue your figures down, but it works for me. If you are going to use shelving I recommend glass over wood or solid shelving. Glass shelves will let the light filter down and look to take up less space than solid ones do. They also just look better. The same is true for glass shelving in bookcases. Also glass shelves low to the ground will not block out what is below them like a solid shelf will. 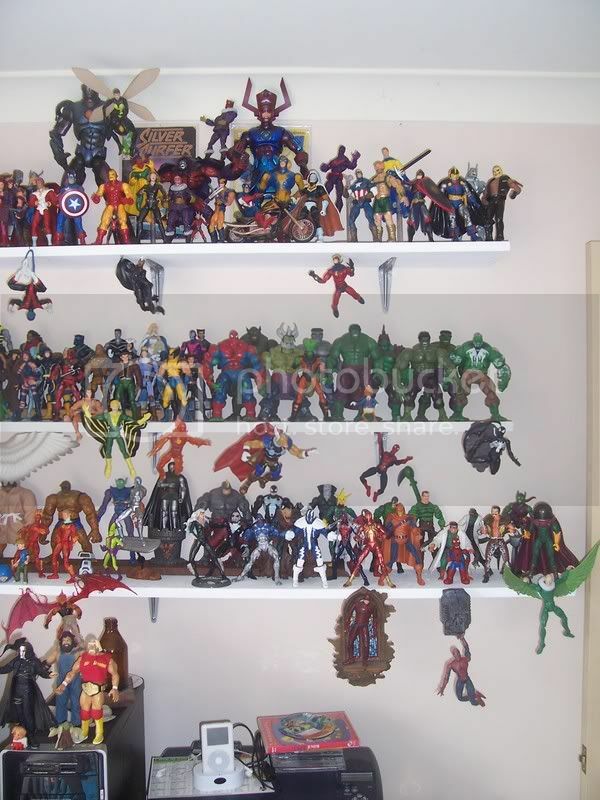 It’s simple to put up and I like the figures like Spider-man hanging upside down and others flying along the edge. Hanging things takes up a new thought process too. I hung Star Trek Starships and Batwings and such from the ceiling. I hung them above 6 foot 2 or 3 inches so most people will walk under them (I'm six feet tall) or I hung them close to a bookcase so nobody would walk under it. The last thing you want is somebody to lean over to look at something on a low shelf and then stand up and knock out something hanging. 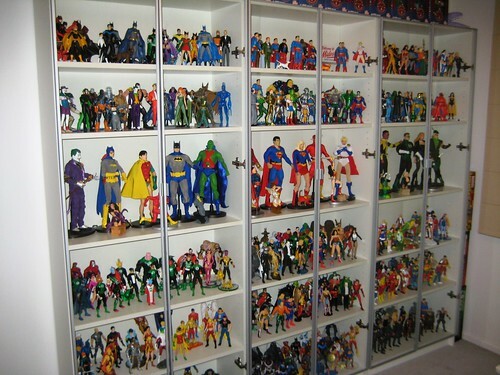 So how do you sort out your action figures? That is up to your preferences. 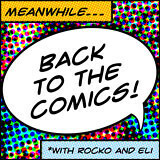 You can sort them by series like all JLA or Legends Of Batman or whatever. You could sort them in order. I sorted my Star Trek figures in chronological order based on the different TV series. The original series followed by Next Generation, Deep Space Nine and then Voyager. 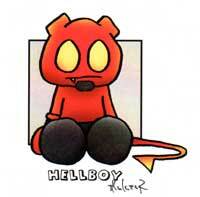 Or like what supermarvel1 did with these. The best advice is to take your time and look at every option you can. Plan it all out before you start work and everything should be fine. In my case I ordered too many of the Mini Mag Stand displays as I did not take into consideration height issues in the bookcases. They also built some of the bookcases a ½” less deep than others and the Mini Mag Stand displays would not fit and I had to trim some of them to fit. I also decided that glass shelving would look better for my Batmobiles so I will change out the Mini Mag Stand displays currently holding them one day. So be flexible with your plans as they may change once you start working on it. Great summary of the various bits and pieces F! Love it! Especially using the galleries we have here to provide references. Certainly saves you looking. Hey,look at your Point count Westy.It's the magic number! 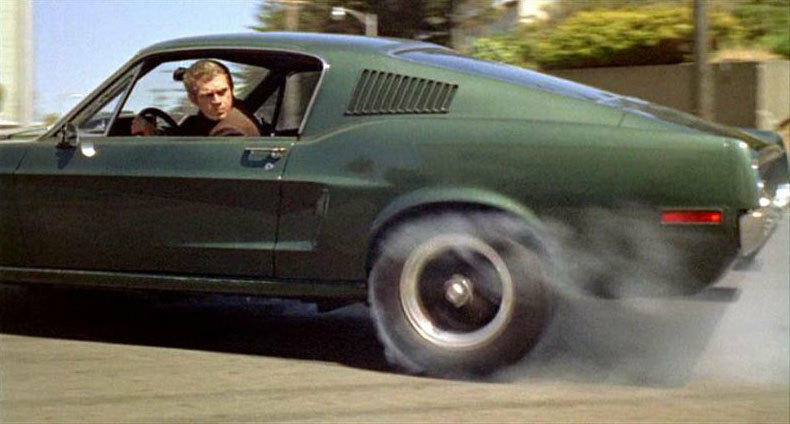 - FB on West accumulating 69 points. Awesome stuff FlaBat! Thanks for the summary!! Top notch and detailed work as always mate,you never disappoint.Really inspired idea and definitely pointworthy! Thanks guys. Could somebody Sticky it for me so we have it handy for people looking for ideas on displays. Are those Parrothead plates on the wall FlaBat? Awesome. I'm a Parrothead. Yes they are. I have one of his books that he autographed and quilt my mother in-law sew up made from old Jimmey Buffett T-Shirts. Here are two examples of using a narrow shelf I got at a home improvement store and set it in the fixed shelf space of a bookcase. To support it I used two wire mesh Pencil Cups I got at a home improvement store. It allowed for more items in the same space as I could tuck some under the smaller shelf. Above I took a wire mesh Copy Stand used to hold a book that I got at an office supply store and bent from the original “V” shape to a 90 degree angle to make a small shelf on a bookcase. I used small screws to hold it in place. The Batcopter (left rear) sits on a clear plastic box. I used lots of clear plastic boxes in a step display. The Batjet hangs on a flying stand I made from bending a paper stack pin (not sure of the name, but it’s a spike that sits on a desk) that you can get at any office supply store. I originally used it as an idea for flying figures like Superman but ended up using it for the Batjet so I could get all the vehicles from that series on one shelf together. For Superman I drilled a hole in his foot and bent the stand slightly. Look closely at the above picture and you see items from a typical office desk reused for display. At the back are wire mesh stackable In/Out Trays. I drilled holes in their bottoms and put in Machine Screws held in by Nuts an Washers to use as pegs to hang the Phasers. I then mounted them on the back of the bookcase wall. A small wire mesh cup was turned upside down and now has the Klingon Disruptor resting on it. Wire mesh Business Card holders were perfect for TNG Tricorders on the left side and TOS Communicators and TNG Phaser and Communicator from the latest film on the right side. I like using playsets for displays whenever possible. The playset in the two pictures above is the same model (different series versions) only the one on top shows the outside of Wayne Manor and inside of the Batcave and the lower pictures shows what is on the other side. Call me crazy but doesn't supermarvel1 has some figures that aren't out yet? 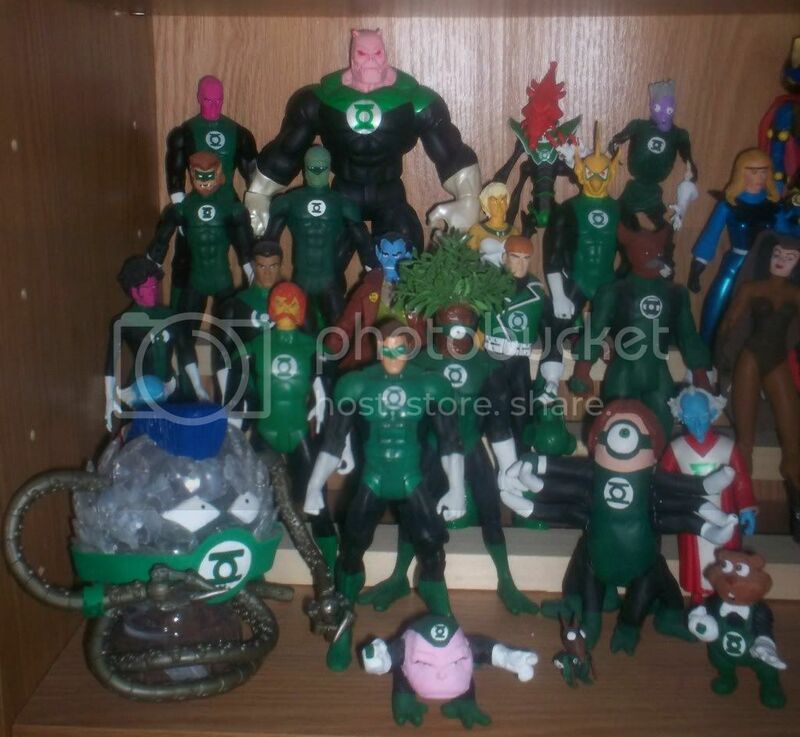 JLA Classified Hal and Batgirl as well as Blackest night John? or I'm seeing things? I'll show you how did it went! may also try the tip for play sets and ships since been trying to figure out how to better display my xmen black bird. and my bat cave better. 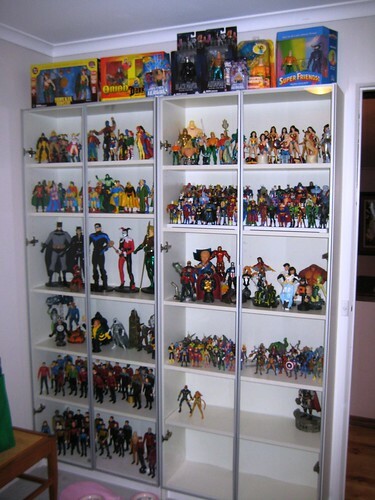 as for me i also use for display purposes shadow boxes they work good for certain figures espically the three inch line. 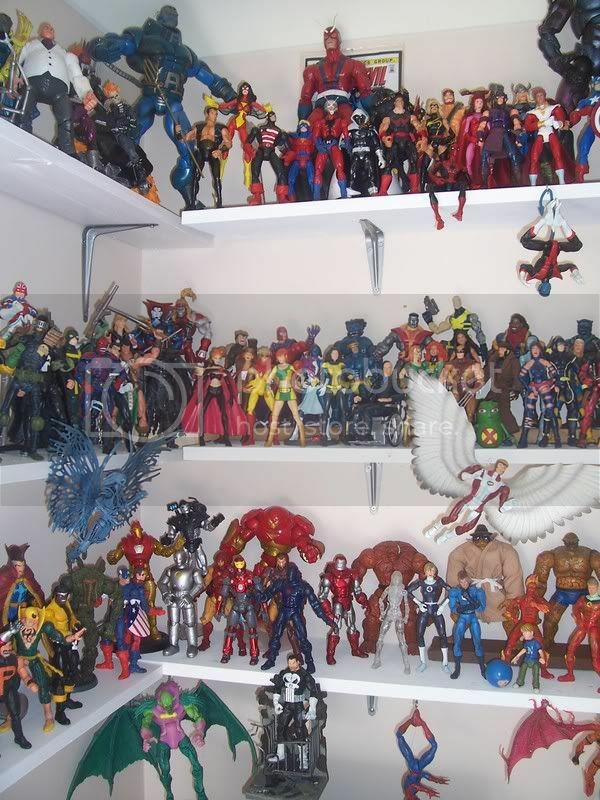 or in my case have my transformers my version of the Jla they work good espically for wanting to hang figures on walls. and keeps out having to dust the figures for a while till one decides to switch out the display. Holy cow those pics are wicked! how the hell do you guys do the dusting!!! !